Happy Halloween! If you’re like many of us, you haven’t put much thought into your costume this year. Now that October 31 is here, you’re scrambling but can’t bear the thought of venturing to one of those crazy Halloween stores or braving Value Village. Fear not, little ghouls and goblins! We have tons of costume ideas for you using everyday household items that can be thrown together in minutes. This year there are lots of famous faces that can make quick and easy costumes. If you happen to be a female with long hair of the brown variety, Kate Middleton is as easy as it gets. Put on a tailored dress (and a trench coat if it’s chilly) and some ladylike pumps. Use a curling iron to add some waves to your hair. Voila! Bonus points if you have a Prince William lookalike to trail around with you. 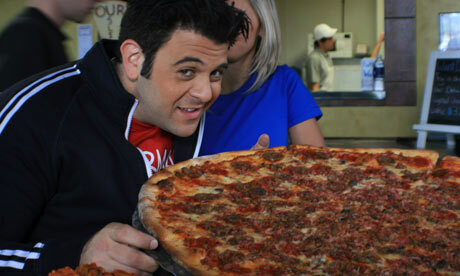 The Man Vs. Food guy is another super easy costume. All you need is a huge plate of food – wings, pizza, nachos, whatever. Carry it around and shove handfuls of food into your face at frequent intervals. Occasionally groan. An added perk: you’ll be too full to eat the leftover candy at the end of the night. If you’re a lady who happens to have leggings and booties in your closet, Kim Kardashian is an easy choice. You’ll want an obnoxiously large engagement ring but you can make your own with balled-up tin foil and a twist tie. Obviously this works better if you have long black hair, but if so, it’s a pretty simple look to pull together. Hobo: Wear a tuque and an old coat. Draw on a beard. You could also push a shopping cart around, but we recommend digging one out of a ravine that’s already been trashed rather than making off with a new one from Micmac Mall. Cat: Black sweater, leggings, headband with construction paper ears, and eyeliner nose and whiskers. Skeleton: Wear all black and apply masking tape “bones” to your body. Most Extreme Elimination Challenge contestant: Shorts, t-shirt, bike helmet, knee pads/elbow pads. Pig in a Blanket: Cut out a pig snout from an egg carton and draw two nostrils on it. Tie it around your face. Wrap up in a blanket. 50’s Couple: A suit and tie for him, a dress and apron for her. You can embellish it by carrying a rolling pin, cookbook, etc. I don’t know what 50’s men carried around. Booze? The newspaper? YouTube sensations make great Halloween costumes (remember the Bed Intruder last year?) 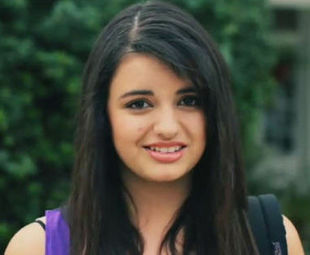 This year we have Rebecca Black! Program “Friday” into your cell phone. Set the alarm to go off at 10 minute intervals. Lip-sync poorly while trying to maintain a brave smile. Act confused when it’s time to get in the car to go anywhere (“which seat should I take?”) Done! There are also some Halifax-centric costumes you could try. If you own a black hoodie and a baseball bat, you’re a swarmer. Or cut out a big oval shape out of cardboard and cover it in tin foil. You are the Oval! If you’re going out with friends, they can wear winter coats, mitts, hats, and carry skates. Easy group costumes FTW! Now that your costume is ready to go, get out there and fill those pillowcases!